It was my unlucky day. I faked being sick so I could miss school. My plan was to hang out with Piper, my dog. Read comics, Eat Gran’s apple cake. But that was before the weather alert about Cyclone Thelma. Gran was in a panic. My plans were in a mess. Danny and his family live in north-western Australia, where cyclones are an irregular reality. Gran has lived here all her life and has experienced many cyclones so she knows what to do when the weather reports begin monitoring a storm at sea. Danny’s plans of a relaxing day at home with is dog go out the window as Gran and the family make their preparations. Not everyone thinks this level of preparation is necessary, but what Gran says, happens. As the storm approaches, Danny begins to realise the danger a cyclone can bring to a town. Perhaps Gran knows more than the weatherman? On each page there are words presented in different font, sometimes because they may be challenging for young readers. Each opening includes header and footer illustrations and there are colour illustrations on every page. 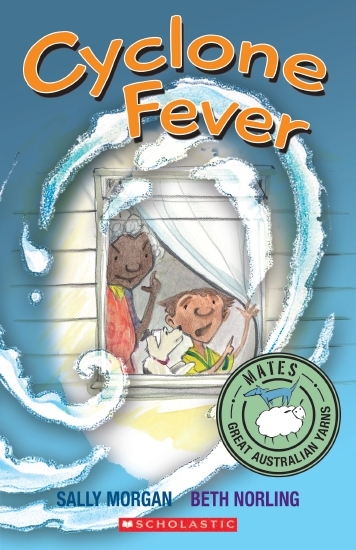 Cyclone Fever is a new title in the fabulous ‘Mates’ series from Omnibus. Each title presents a particularly Australian story. Cyclone Fever is funny and real, showing a multi-generational family living their normal life – which just happens to include cyclones. The approaching storm is treated with the respect it deserves. The family works together to prepare and they also extend that support into their community. The characters are warm and empathetic and Danny’s story is told with great humour. Recommended for early primary readers. There are so many kids in Reuben’s family, his mum has to count them when they go out to make sure no one gets lost or left behind. ‘One, two, three, four, five, six, seven, eight, nine,’ she says touching each one as they climb in the car. Reuben’s big brothers and sisters duck and growl. But Reuben loves his mum touching his head and counting. It makes him feel safe, because he knows she will never leave him behind. Reuben is part of a large family living in the north of Australia. Every Saturday they go fishing. This Saturday, they are going to One Mile Beach. Reuben loves to go, but he also does some worrying. He worries a bit about the waves, and the crabs and other things that might go wrong. As the outing progresses, Reuben, although sometimes scared, calls on all his inner resources so he can help where help is needed. With the help of his brothers and his father, he decides to be brave and to be strong, where this is required. Helping his father and his bigger brothers makes him feel different. He’s not quite sure how it feels and wanders off to think about it instead of taking a nap with his younger siblings. And that’s when the biggest test of his strength and bravery is needed. ‘Losing Reuben’ is illustrated throughout in colour. A header and footer shows Reuben cartwheeling across spreads, progressing as the story unfolds. Some words are picked out in larger or different fonts. 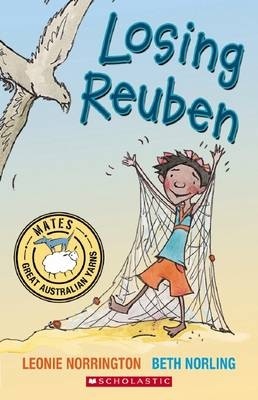 Losing Reuben is a new title in the ‘Mates’ series from Omnibus Books. This series offers uniquely Australian stories for newly independent readers. It introduces a way of life particular to the north of Australia and indigenous Australians. At the same time, it is a story common in many families. Reuben is a small (but not the smallest) member of a large family. In the past, he’s been one of the little kids, staying with his mother and older sisters as his father and older brothers embark on more adventurous aspects of their outings. But this time, he’s in transition to being one of the big kids. And that means facing his fears. These challenges are just a normal part of the day. Reuben, like many children, internalises some of these fears, but when required to, finds a way to overcome them. ‘Losing Reuben’ is a delightful story of the ups and downs of being part of a large family. Recommended for newly independent readers. It was June, cold and dry. Sophie couldn’t wait a minute longer. ‘Mum, I know what I want for Christmas. I only want one thing. Sophie is absolutely certain that she only wants one thing for Christmas. And birthday too, if necessary. A puppy. And she knows just exactly what sort of puppy she wants. She has their life together mapped out. But life doesn’t always deliver what we think we most want. And that’s certainly the case here. Boris is nothing like the dog she’s researched, prepared for and even named. But it’s Boris who has come to stay while her owner is out of action. And Boris is almost the exact opposite of the dog she must have. She’s going to have to work hard to get the dog she wants. Coloured illustrations on every page add humour and break up the text into achievable bites. (he-he) A header and footer suggest the great Australian backyard. Aussie Dogis a new title in the Omnibus Books series of Australian tales for newly independent readers. Text type varies and highlights words that may provide extra challenge, or perhaps just need emphasis. Sophie is every child who has ever wanted a dog. She’s done her research and she’s sure her fairy tale dog exists and is just waiting for Sophie to discover. There is a gentle suggestion that what we want is not always what we get, but that it can be even better. But it’s subtle. Aussie Dog, like other offerings in this series, has a laugh a page as a child’s imagining is brought to life. Although Sophie seems totally single-minded, she is an open, good-natured and helpful sister, daughter, friend. Recommended for children transitioning from picture books to longer texts, and older children needing an accessible read. Little Else lived with her grandmother at the bottom of Stony Gully. Times were tough. It hadn’t rained for years. There was nothing in the garden except one small cabbage and a stick of celery. Little Else and her grandmother were so poor they only had dinner once a week. They were so thin they had to walk over the same ground twice to throw a shadow. One day, a man came to the door of their hut. He had large muscles and a handlebar moustache. ‘There’s no spare children here, Mr Strong,’ she said. Little Else loves her grandma but also wants to experience all the world has to offer. So when the opportunity comes to join the circus and be paid in gold, she sees an opportunity to see the world and to provide for her poverty-stricken grandmother. She’s a plucky, audacious heroine with the ability to converse with animals. This skill comes in handy as she is tricked into joining the circus (Trick Rider), leads her own group of bushrangers (On the Run), and hunts down a legendary group of cattle (Ghost Hunter). It seems there is no injustice she can’t right, even at the cost of getting her face on a ‘Most Wanted’ poster. Even her horse begins to wonder if he should have stuck with Harry Blast, a notoriously bad-tempered bushranger. Little Else is a wild child. Little Else is seven years old and she can do anything. And she does. With dry humour and wonderful place names like ‘Witt’s End’, Desolation Ranges, Windy Ridge, Dead Man’s Gap and Mt Long Gone, Little Else leads her rag-tag bunch of companions on missions both far-fetched and far-flung. All the characters are full of humour and personality, from the laconic bushranger’s horse ‘Outlaw’, to the cannibal’s child ‘Toothpick’. Little Else is a magnetic character, attracting loyalty from all those she meets, but suspicion from those who don’t know her. Her release of knackery horses earns her the title ‘horse rustler’ and another Wanted poster. Little Else is told in third person and the most wonderful deadpan humour and will have newly independent readers chuckling out loud. In contrast to the colourful characters within, the covers of each title are pastel, perhaps suggesting that people should not be judged on appearances (age, gender…), but also to entice small girls into something other than fairies and princesses. Wonderful fun. Jack has always wanted a dog, but his parents say he must wait until he is older. When he sees an advertisement for a pet-sitter he sees his chance. If he can look after the dog for a week, maybe his parents will let him have a dog of his own. But looking after big, friendly Samson is not as easy as Jack thought. Samson digs, and chews and wees and poos. It is a big job to clean up after him and keep him entertained. The Dog Sitter is a Solo title for beginning readers making the transition from picture books to chapter books. With loads of illustrations by Beth Norling and simple yet lively text, it will appeal to young readers. A cute and engaging story.